I am lucky to have a great local baker as a friend, and she recently made these Disney Inspired Dole Whip Cupcakes. Not only did I get to try some out first hand, but she let me share the recipe here with you since I will be at Disneyland in a few weeks. Make sure to check out all of Amber & Krista’s amazing cupcake recipes on their website as well. One thing we love when we visit Disneyland are Dole Whips. Of course, my first Dole Whip experience was actually at the Dole Plantation on Oahu, Hawaii. Ever since I tried one there, I knew I would love them forever. The fact that I love pineapple, cupcakes and Dole Whips meant this was cupcake I knew I wanted to share. Amber is a great baker and often lets me taste her fun new recipes. This one is super moist, full of flavor and a favorite in our house. It is reminiscent of the frozen treat at Disneyland, but also simply a delicious cupcake recipe that I know you’ll love. The cupcake itself uses pineapple extract for flavoring, but I bet it would be great if you added fresh crushed pineapple directly into the batter. Sift flour, baking powder, salt, and baking soda together in a bowl. Beat butter on high for 30 seconds. Add sugar, vanilla and pineapple extract to the butter until well combined. Add egg whites, one at a time, mixing after each. Add eggs, one at a time, mixing after each. Add flour mixture to the wet mixture; alternating with the buttermilk on low speed until it is thoroughly blended. Scoop the batter into the lined cupcake holders till ⅔ filled. Remove to a wire rack until fully cooled. Add powdered sugar, ½ C at a time. Cream both until light and creamy. If not creaming slowly add a little whipping cream. Mix the pineapple extract with the butter and powdered sugar. Test to see if the frosting can make and hold a stiff peak. Test by pulling out a spoonful of frosting holding it upside down. If it doesn't drop then your frosting is done. If not add ½ C powdered sugar. Test again to make sure the frosting can make and hold a stiff peak. Spoon frosting into a pastry bag with a frosting tip. Twist open end to push frosting to the tip. 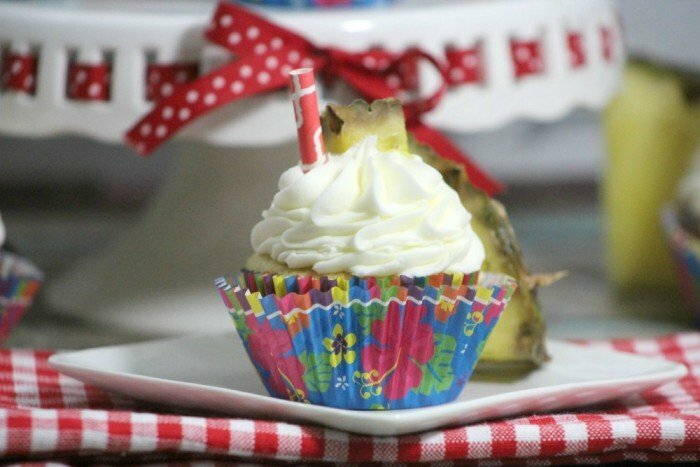 Place a small pineapple wedge on top of the frosted cupcake. Now, with Amber’s cupcakes the one thing that is simply to die for is the icing. She makes some of the most creamy and delightful rich icings I have ever tasted This recipe is one you will want to make in large batches and eat with a spoon, or perhaps some animal cookies. Seriously, it is one of the best icing recipes you will ever find on the Internet. 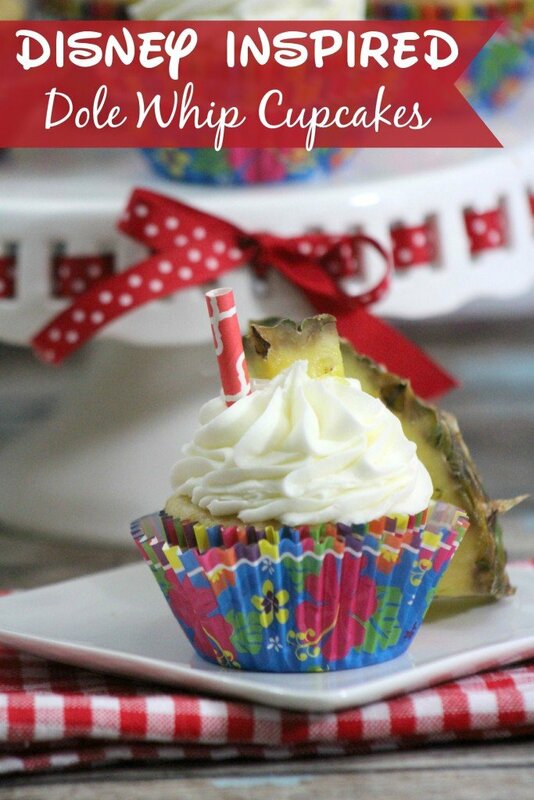 These Disney Inspired Dole Whip Cupcakes are really delicious, and a great choice for a Disney inspired birthday party, summer barbecue or just because! Check out some other yummy desserts! Another great idea for birthday parties! 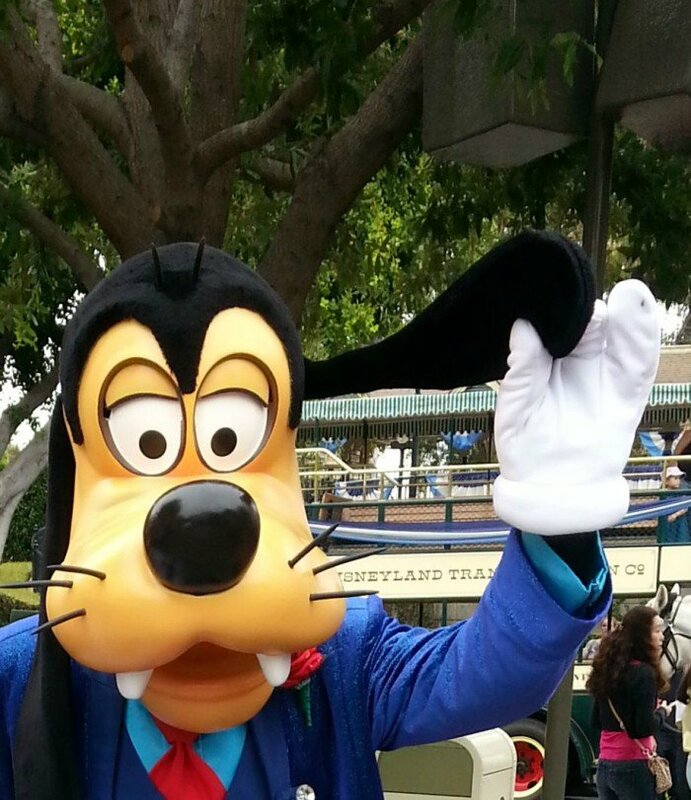 Disneyland vacations are always a great way to spend time with your family. They can be rather pricey, but for many it is an expense well worth making. 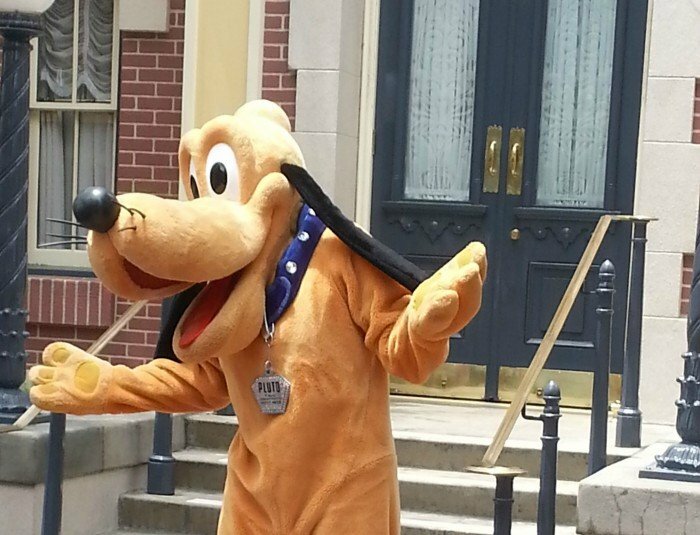 If you are able to go to Disneyland for more than just a day, there are a few things to keep in mind to get the most out of your time in the park and resort area! 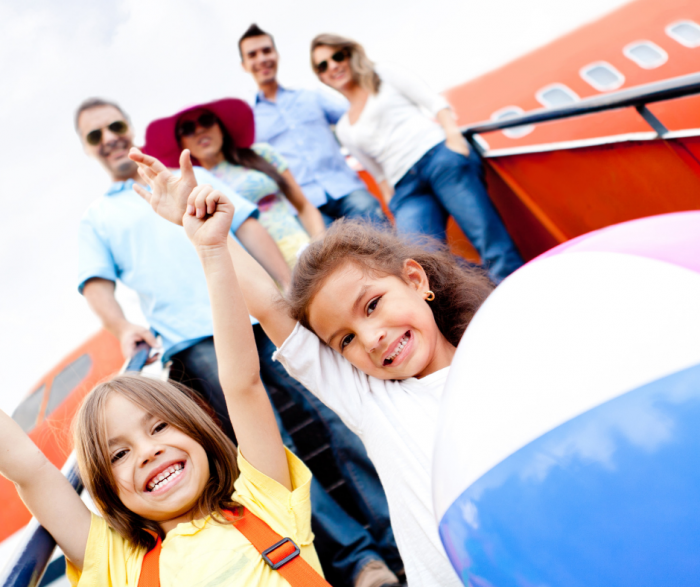 First off, though, we want to mention a couple of musts to save you a bit more money on your trip. 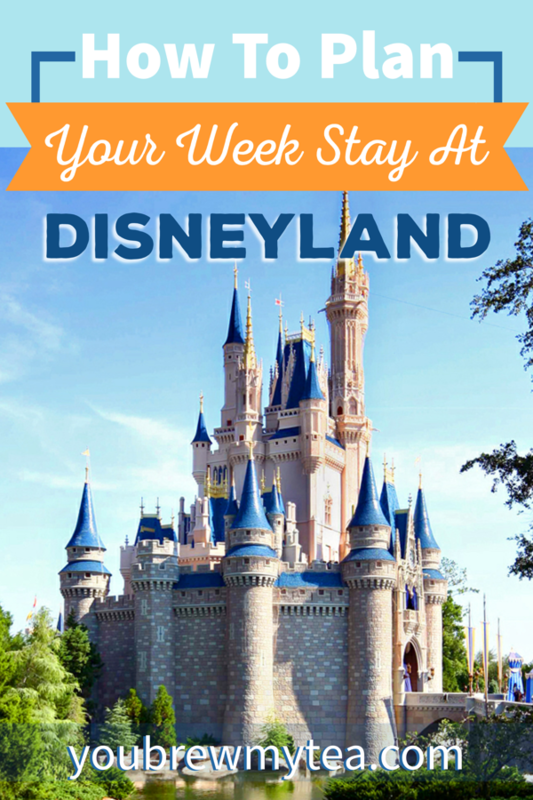 You need to check out our tips for how to go to Disneyland on a budget for some simple ideas, but also, make sure to check out Citypass. If you plan to do much in the area, Citypass will provide you with the best deals on tickets to the parks and other area attractions in Southern California. 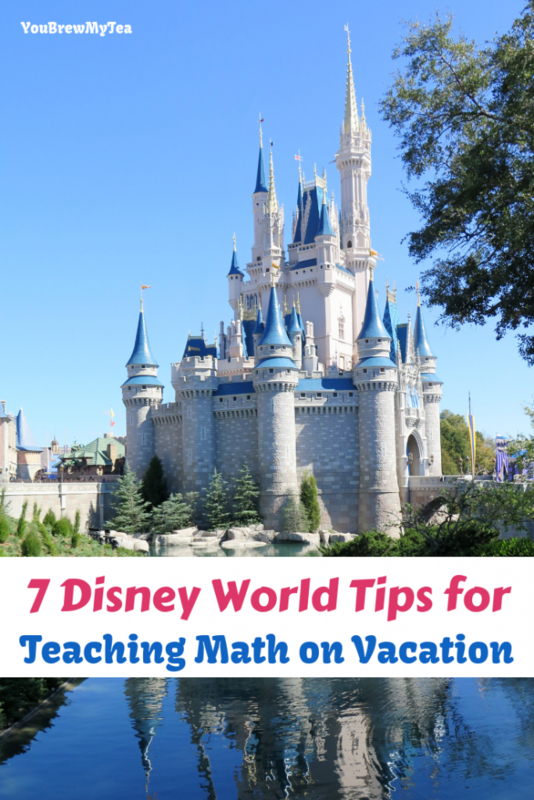 Now let’s get down to the nitty-gritty and get into what it takes to plan fun-filled Disneyland vacations for your family. Every family is different. 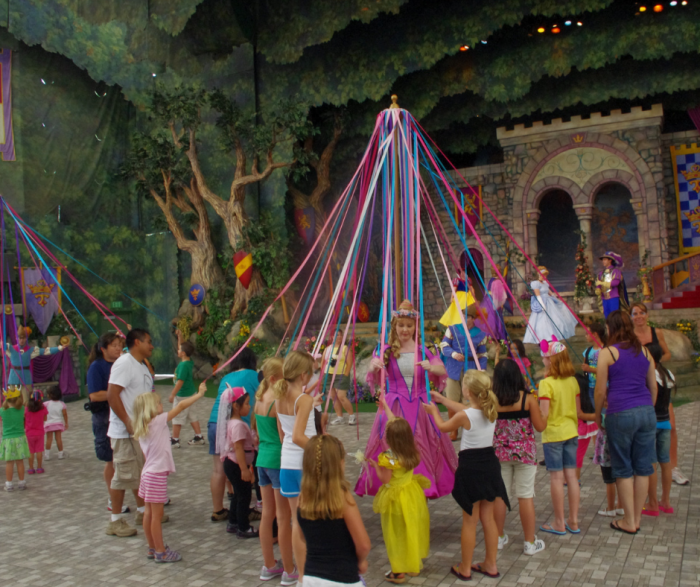 We only have boys, so the princess themed activities aren’t on our lists, however there are other character things we tend to be interested in. This list is really going to be pretty open ended so you can personalize a bit more for your family. Choose an on-site or local hotel. 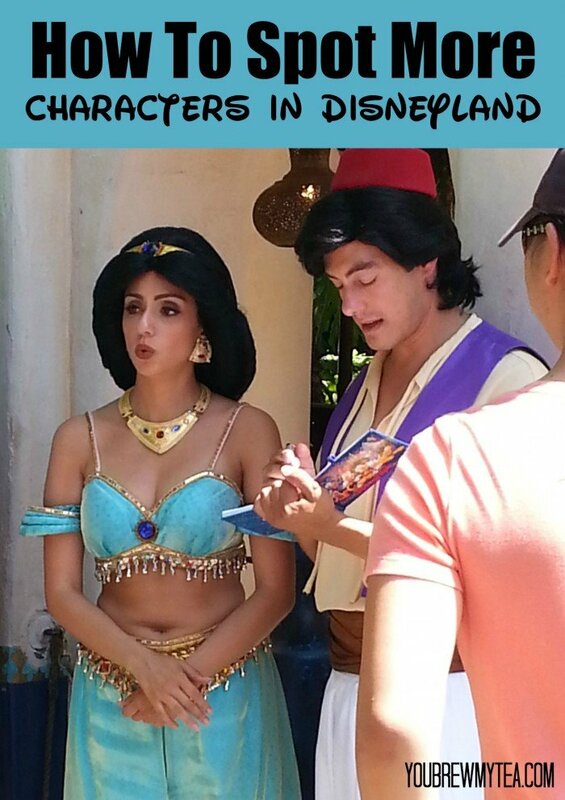 There are tons of hotels in Orange County where Disneyland is located. Many of these off park hotels have reasonable rates that could offer great savings. However, staying near the park gives you some dual benefits to consider. No parking fees since you can walk or ride the trams to the park. That’s $20 a day in savings, which may not seem like much but over the course of a week in the park can be over $100. Easy to go back to the hotel to rest if you or the kids just get too tired. This will happen more often than you’d like to admit during a week stay at the park. Easy to go back to the hotel and eat meals and save money. Map out the park before your arrival to determine what you want to see most. If you look online, or grab a free Disney map from their website, you can easily see what areas of the park are going to be of more interest to you. While my Beau and I love Main Street, our son tends to prefer Fantasyland and Tomorrowland. We compromise by planning more time in his favorite parts of the park, then wind down at the end of the day in our favorite areas. Planning ahead can also give you the ability to plan a day for each “land” in the park. That way you can ride all of the rides you want, without rushing or missing something important each day. Check the calendar of events. From character breakfasts and tea parties, to celebrations for the whole park due to anniversaries or holidays, the calendar of events can really help you plan for your trip. If you know there will be a bigger parade at a certain time on Main Street, and your child tends to clam up in larger crowds -you can easily avoid that area by planning to be elsewhere in the park. The calender of events on the Disneyland website is so important! In fact, when you are considering how to plan your Disneyland vacations, thinking about various annual events will definitely come into play. Make dining reservations ahead of time. Trust me on this one. No matter how slow it may seem when you arrive in park, there are many of the best restaurants that are already booked months in advance. Check online and reserve your table well in advance to make sure you get to dine where you want. This includes main stream restaurants throughout the park as well as the specialty meals with characters. We love the Monte Cristo at the Blue Bayou but it is booked out months in advance. We plan ahead and get a lunch reservation at least 2-3 months before our trips if possible. There are many tips for how to pack and what to pack that we will cover at later dates. As you begin your planning, these are things to think of ahead of time. Knowing how to plan your Disneyland vacations will help your family adventure in the greatest place on earth to be that much more special for everyone. Check out our other travel tips and suggestions in the posts below!